All three of the Honda trimmers offered feature the 4 cycle engine (plain gas is used as fuel), with 35.8cc displacement. A 4 cycle engine is more efficient than the 2 cycle engine, and produces a much cleaner exhaust. California has higher standards for engine exhaust, and Honda not only meets these standards, but uses the same technology across the country. The disadvantage of a 4 cycle engine is added weight, due to a reservoir of oil used for lubricating the engine, and many more moving parts in the engine. A 2 cycle engine has exactly 3 moving parts ( piston, rod, and crankshaft), while a 4 stroke engine must also include a camshaft and intake and exhaust valves. The Honda string trimmer model HHT25SLTAT has the 25cc 4 cycle engine, powering a straight flexible shaft that carries a lifetime warranty. The cutting head is a Semi-matic bump head, which advances cutting line when bumped firmly against a hard surface at high engine speeds. The handle is the typical loop style - adjustable to the position on the shaft that is preferred for optimum balance. The weight of this economically priced trimmer is 13 lbs, which is not bad for a 4 cycle trimmer. In fact, Honda brags this is the lightest 25cc 4 cycle trimmer engine available today. The price for this technological wonder is a reasonable $350.00. The Honda string trimmer model HHT35SLTAT is powered by the 35.8cc four cycle engine. The drive shaft is straight, using a flexible shaft cable ( most manufactures use a solid steel cable in the straight shaft models), Honda offers a lifetime warranty on the drive shaft, so confidence in this design is high. The cutting head is Semi-matic - line is advanced when the head is bumped on the ground firmly when the engine is at full throttle. A single harness and loop-style handle come standard. This trimmer has a 2 year residential or a 1 year commercial warranty. MSRP is $379.00 for this light commercial beauty. 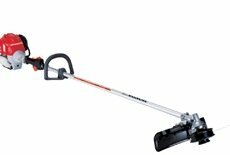 The Honda string trimmer model HHT35SUKAT is powered by the same 35.8cc four cycle engine. The drive shaft is straight, using the innovative flexible shaft cable. The cutting head is the manual feed type, dispensing the standard nylon cutting line. This hot rod also comes equipped with a bicycle style handle to allow better control when using standard brush blade. A double harness is standard, along with a pair of safety goggles. Let the wood chips fly! This trimmer has a 2 year residential or a 1 year commercial warranty. MSRP is $430.00.00 for the king of the Honda trimmer jungle. For those sold on the Honda brand, this excellent line of trimmers will be sure to please.